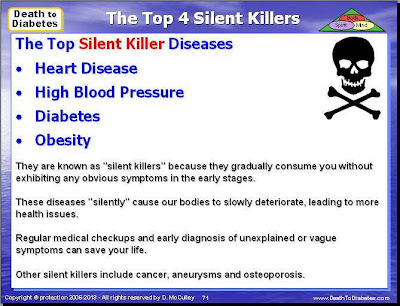 There are a number of diseases and illnesses that are known as "silent killers". They are known as "silent killers" because they gradually consume you without causing any serious symptoms in the early stages. These silent killers are characterized by subtle symptoms that often go undetected. In women, these stealthy life-threatening illnesses strike up to 10 million each year and kill over 100,000. These diseases "silently" cause our bodies to slowly deteriorate, leading to more health issues. Regular medical checkups and early diagnosis of unexplained or vague symptoms can save your life. 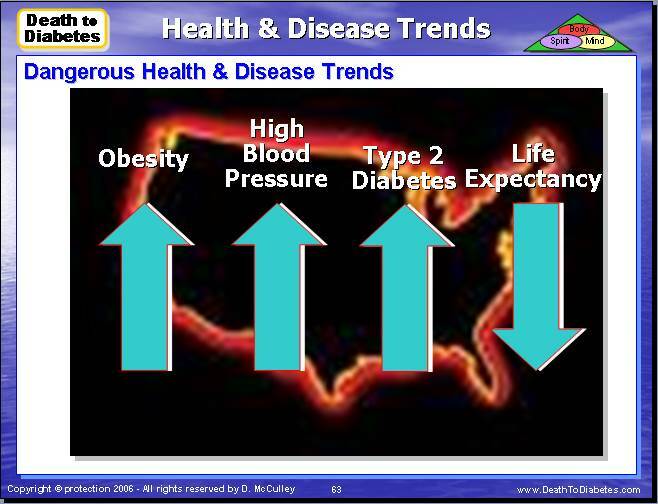 Heart disease, high blood pressure, diabetes and obesity are the top 4 major silent killer diseases. 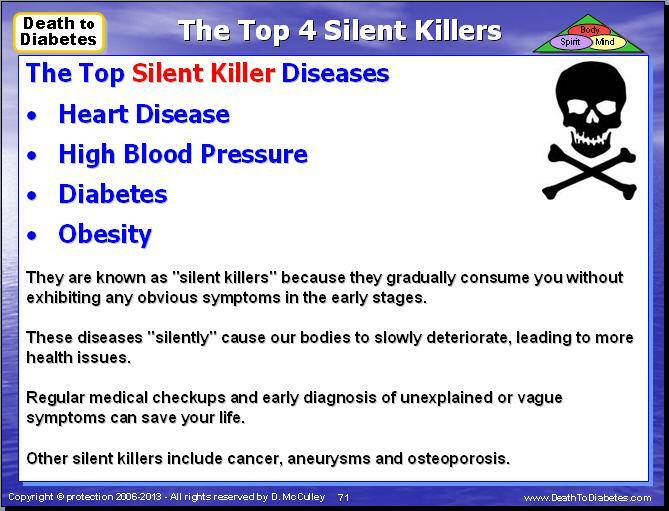 Other silent killers include cancer, aneurysms and osteoporosis. Heart Disease. Heart disease is the number one killer in the world. And heart disease can gradually build up as most people live with some form of heart disease for years until one day when they have a heart attack or a stroke. All of the risk factors such as high cholesterol, high blood pressure (hypertension), obesity and diabetes can gradually damage the heart. It is important to always assess your risk factors for heart disease at regular checkups. Heart disease or even heart attacks do not usually occur spontaneously, but occur after a gradual build up, particularly from arteriosclerosis. However, heart disease can be reversed with a plant-based diet, regular exercise, and proper supplementation. High Blood Pressure (Hypertension). This is a silent killer because it is deadly and has no early significant symptoms. The American Heart Association estimates that up to one third of people living with high blood pressure are unaware of the fact that their blood pressure is high, and many people are unaware of the risks of high blood pressure. The danger from high blood pressure is the extra load on the heart, leading to complications such as hypertensive heart disease. High blood pressure can also seriously damage the kidneys. And it does all this silently, without any major symptoms, except when the high blood pressure gets extreme. Always get your blood pressure checked to rule out hypertension as part of regular medical checkups. High blood pressure affects millions of people around the world. This condition goes unnoticed for years unless we have the insurance to receive annual physicals and blood tests from our primary care physician. For the people who are able to afford insurance and get annual physical exams, they end up "controlling" their blood pressure by taking drugs that mask the real problem and give us the false sense of security that everything is fine. But, over a period of years, we find ourselves having to take more and more medication to 'control" our blood pressure. Until one day, you discover that you have problems with your kidneys, liver, or heart due to taking these medications for so many years. Type 2 Diabetes. This disease affects millions of people in the United States and around the world. Most people are surprised when they get diagnosed with diabetes. And, because there are no obvious symptoms or discomfort, we think everything is fine. As a result, we either ignore the disease or we take a diabetic pill such as metformin. And, because the metformin lowers our blood glucose level, we live with a false sense of security. High Cholesterol. This condition was well-known as a killer until recent research discovered that high cholesterol is not as major a problem as originally thought. However, having high cholesterol is still a major risk factor for heart disease. High cholesterol is also "silent" because it usually does not cause any significant noticeable symptoms. Be careful not to fall into the dangerous trap of taking statin drugs to lower your cholesterol. There are a lot of safer ways and less expensive ways to naturally lower your cholesterol. Obesity. This disease is truly one of the most misunderstood health issues of our time. In fact, not until recently, the medical industry didn't even consider obesity to be a disease. For most people, obesity is simply a condition of unwanted weight gain. But, there is more to obesity than just "weight gain"! Obesity is a progressive disease of cellular inflammation and insulin resistance that can lead to other health issues such as heart disease, cancer or Type 2 diabetes. Osteoporosis. This health issue is not widely thought of as a killer. And yet osteoporosis is a major risk for the elderly, particularly women, because osteoporosis kills and debilitates from hip fractures or femur fractures resulting from falls. Younger and middle aged women should be particularly concerned about avoiding and getting tested for low bone mass (bone thinning) that leads to osteoporosis. One common form of diagnostic test for osteoporosis is a heel ultrasound test of bone density. Obstructive Sleep Apnea. Insomnia can kill you? Sounds ridiculous. However, insomnia is often a symptom of sleep apnea, where a person actually stops breathing for a period of time during sleep. The most common kind is obstructive sleep apnea where the throat becomes obstructed during sleep, such as if a person is overweight. It still doesn't sound serious, but it is. Sleep apnea can be a major cause of undiagnosed hypertension. Breast cancer. This disease is one of the top five malpractice diseases. Misdiagnosis of breast cancer can occur, and the prognosis for a late discovery of breast cancer can be poor. Undiagnosed breast cancer is also often a "silent killer" because the breast pain is often a late symptom of breast cancer rather than an early symptom. Some people assume it can't be cancer without pain. And although many breast cancers arise from a discovered breast lump, not all breast lumps are discovered early. Other Cancers. Colon cancer, Lung cancer, Ovarian cancer, Prostate cancer, and Mesothelioma are other silent killers. Brain Aneurysm. An aneurysm is a silent killer because, in most cases, there are no symptoms until moments before the aneurism ruptures. An aneurism is a potentially life-threatening condition in which there is an abnormal swelling and ballooning of an artery, which can rupture and result in internal bleeding. Aneurysms can occur in any artery in the body, but the most common site is in the aorta (aortic aneurysm), followed by the arteries of the brain (brain aneurysm). An aneurysm develops when there is damage or a weakening of the wall of an artery. This weakened area can balloon out, disrupt normal blood flow, and rupture due to the force of blood flowing through the artery. So, what if one of these silent killer is stalking you, but you don't know it? We recommend that you visit your primary care physician at least once a year for a complete medical exam. A complete medical exam usually uncovers most of these silent killers. However, we don't believe that you should rely solely on a medical exam, especially if you happened to end up in the hospital like the author! We strongly recommend that you make specific lifestyle changes that should include transitioning to a plant-based diet such as the Death to Diabetes Diet and a regular exercise regimen of walking and stretching 4 to 6 times a week. Please Note: The Death to Diabetes Diet is not just for diabetics! 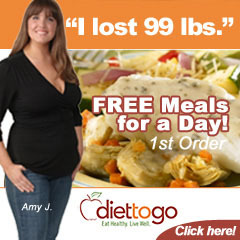 Non-diabetics can also use this diet program. Warning! More than 87% of people who end up in the hospital after an attack from one of these silent killers, do not change their eating habits or lifestyle. As a result, 91% of them return to the hospital or end up in the graveyard. 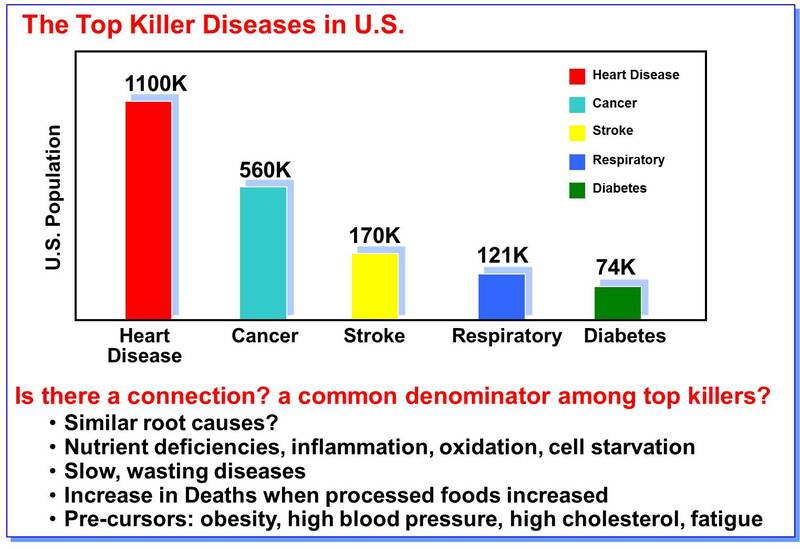 FYI: Ironically, many of these silent killer diseases are fueled by what the author calls the "triple-killer foods" along with the 5 "dead" foods. So, make sure that you avoid these foods, especially if one of these silent killers is stalking you.